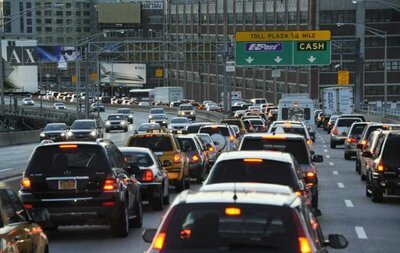 New Jersey - Commuters will continue to face a long line of empty buses snarling traffic at the Lincoln Tunnel after the Port Authority scrapped plans to build a new bus garage in Manhattan. Port Authority officials say they can’t afford the $800 million project because recent toll increases were lower than proposed. The agency’s midtown bus terminal doesn’t have enough room so hundreds of empty buses are forced to return to New Jersey to park between the morning and evening rush-hours. Martin Robins of Rutgers University’s Voorhees Transportation Policy Institute told The Record newspaper that the decision to cancel a new garage consigns New Jersey’s mass transit riders to years and years of congestion and unreliable bus service. 800 million dollars for a bus garage? If "hundreds of buses" means, say, 400 of them, that's two million dollars for each bus's parking space. They could still technically build that garage with non-union contractors and save some $400 million. Why can't they build a over pass from 12th ave out to a man build pier between 30th to 45th st. On the west side Hway! It shouldn't cost more the 100 million dollars. They should Bid it out and get it done! oy the toll "only" went up to $12 on every bridge how could the governors be so mean to only approve that when it should be $15 to go through a tunnel so that way they can build a bus garage while at the same time causing the revenue to be cut in half by turning off so many commuters in the process. The new generation is gonna be divided by the ones leaving new york for good, and the ones never leaving new york because it costs 30 dollars to get somewhere. -making new stations/revamped stations so expensively pretty? I would, for one, rather spend less and get the service than wait around for hours in a nice station. Why do we have to use union labor? 5 people end up doing the work of 1 normal person who is paid by the job! Why not park them in NY ? Why not rent empty land on the West Side ? They can pay more than 1.3 Million Dollars a month and they can park them for more than 50 YEARS !!! It's more than time for a complete and honest accounting of where all PA funds are and where they are being spent. There has been a never ending cry of money shortages...where is it all going? The problem is that all the buses from NJ drop off passengers only at the port authority and there just arent enough landing spots to drop off riders in the morning, so the buses end up sitting in the tunnel and on the ramps for more time than they spend actually driving. What they need to do is divert some of the buses to drop off people on the street like on 8th avenue, 6th avenue, and 3rd avenue. Then a lot of the congestion problem with the tunnel and port authority would be gone. The Monsey bus drops people off on 5th / 6th avenue - why can't NJ Transit buses do the same thing? So why don't they do what everyone else does when they want to buy something big, save some of their money for a few years then buy it. I think it's a little funny they are whining they are not getting as much as they wanted. It's like my son crying that I am giving him only $20 instead of $50. It's still free money.